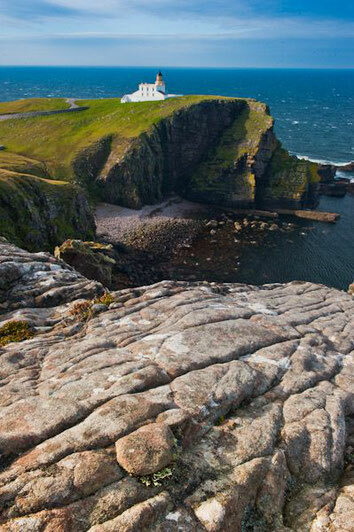 There are almost 200 lighthouses around Scotland’s wild coastline and the Stoer Head Lighthouse, also known as Ru Stoer Lighthouse, is one of them. It is operated and maintained by the Northern Lighthouse Board and the purpose is to warn ships of dangerous waters and provide important navigational information. In 1870 Robert Stevenson designed this dramatic building, the remote and challenging lighthouse location underwrite an amazing historical achievement. The lighthouse is relatively short, only 14 metres high, but its elevation is 54 metres above sea level. The lighting system is an array of sealed-beam electric lamps and must burn at maximum intensity throughout the hours of darkness. 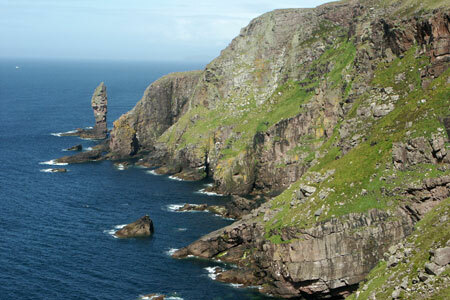 The walk starts at the car park at the end of the road to the Point of Stoer Lighthouse, which is reached from the scenic B869 Lochinver to Kylesku road. This coastal walk in Assynt offers excellent views of this wild coastline and in particular the sea stack known as the Old Man of Stoer. Much of the walk is over rough ground with little evidence of paths so some navigational skills are required. The coast is rugged and often affected by storm force seas especially in winter. The footpath is fairly easy especially if you follow one of the many sheep trods.